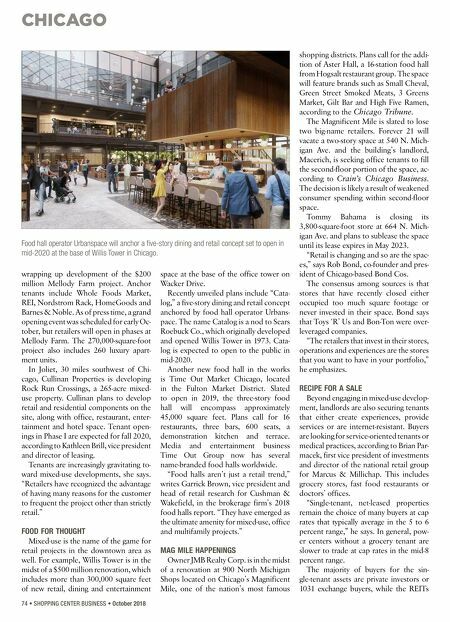 CHICAGO October 2018 • SHOPPING CENTER BUSINESS • 75 and institutional investors are the acquir- ers of the large portfolios of quick-service restaurants, he adds. In Shorewood, about 40 miles south- west of Chicago, a California-based inves- tor recently purchased a 66,437-square- foot, single-tenant property net leased to Jewel-Osco for $13.1 million in a 1031 ex- change. The Boulder Group represented the seller, a Southwest-based private real estate investment company. Not surprisingly, investors that ac- quire multi-tenant shopping centers are aggressively pursuing grocery- anchored centers. For instance, Cincin- nati-based Phillips Edison & Co. invests exclusively in grocery-anchored shopping centers. The company's acquisition strat- egy is to buy well-located centers along main thoroughfares that are easily acces- sible to local residents, according to Jim Farmer, regional vice president of leasing. "We seek to anchor each property with the No. 1 or No. 2 grocer in the local mar- ket," he says. "This ensures a high level of traffic to the center and helps us create a desirable merchandising mix." For Paul Bryant, principal and manag- ing broker with Mid-America Real Estate Corp. in Chicago, there are two types of buyers. The first includes the "core buy- ers" that want to be on Michigan Avenue or State Street and are willing to pay the accompanying high price for space occu- pied by credit tenants with big rents in place. The second group features the val- Are you looking for a Real Estate leader that can provide: Management: Managing all forms of retail assets for all different types of owners. Whether it be value-add, REO or well established retail centers, Horizon Management and Accounting team can service any and all your Real Estate needs. Leasing: Locating prospects and signing Leases to increase occupancy and client demands. With our Tenant Rep team, we also meet client needs for ownership value. Construction Management: (Literally) Building for the Future for any project no matter how large or small. Horizon Realty Services, Inc. has over 100 years of combined retail leasing and management experience to service our clients from all walks of life. 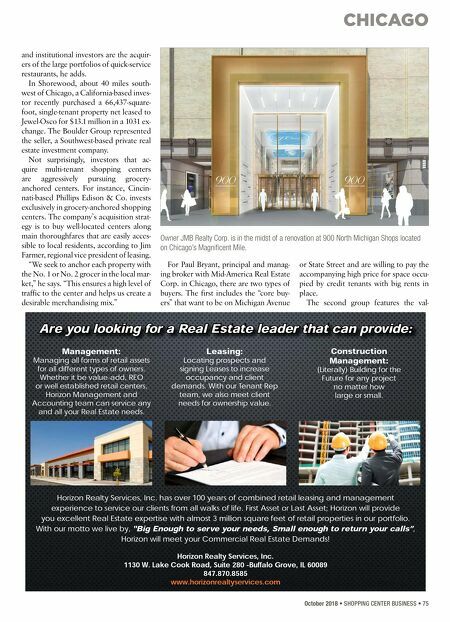 First Asset or Last Asset; Horizon will provide you excellent Real Estate expertise with almost 3 million square feet of retail properties in our portfolio. With our motto we live by, "Big Enough to serve your needs, Small enough to return your calls", Horizon will meet your Commercial Real Estate Demands! Horizon Realty Services, Inc. 1130 W. Lake Cook Road, Suite 280 -Buffalo Grove, IL 60089 847.870.8585 www.horizonrealtyservices.com Owner JMB Realty Corp. is in the midst of a renovation at 900 North Michigan Shops located on Chicago's Magnificent Mile.